Alpha Source's expansion of imaging services into the BMD modality results from strong customer acceptance of company's ultrasound imaging services in 2014. Alpha Source, the Milwaukee-based provider of innovative healthcare technology management solutions, announced today that they will become the authorized service provider for GE Healthcare’s bone mineral densitometry (BMD) products in the United States. The servicing of GE Healthcare’s BMD equipment complements the ultrasound imaging service Alpha Source has been providing on selected GE Healthcare ultrasound products since 2014. 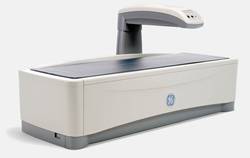 Alpha Source provides a trusted service solution for GE Healthcare’s BMD and selected ultrasound products. The national network of trained field service engineers will be supplemented with depot repair operations in Milwaukee to support this growing multi-modal installed base of imaging equipment. “Alpha Source is building on its growth as an innovative service provider to healthcare organizations by offering solutions that extend the life of medical equipment, reduce equipment costs of ownership and support improved patient care. We’re pleased GE Healthcare selected Alpha Source as its Bone Mineral Densitometry service partner, based on our commitment to delivering value, quality and reliability for our mutual healthcare customers,” said Rick Lytle, Alpha Source’s Chief Executive Officer. Customers received notification of the service transition earlier this month. The full transition of BMD service from GE Healthcare to Alpha Source will take place during 2016. GE Healthcare will continue to design and manufacture BMD equipment and will maintain service in geographies outside the United States. Located in Milwaukee, Wisconsin, Alpha Source Inc. provides innovative solutions in healthcare technology management to customers around the world. Established in 1986, Alpha Source is an ISO13485:2003 certified and FDA registered medical device manufacturer with an emphasis on medical equipment service and biomed parts distribution and logistics. Alpha Source has been one of the INC 5000 fastest growing companies for the past five years. For a complete company description, visit http://www.alphasource.com or call 800-654-9845.